This modern and safe complex was built in the mid '70s. Containing apartments for rent in West Montreal, it is carefully maintained, in tip-top shape, and located in the beautiful neighbourhood of NDG, just South of Sherbrooke Street West. It is ideally located for quick access to many expressways - 13, 15, 20 and 720. Public transit users will appreciate the fact the Vendôme metro station is only 8 minutes away by bus. In terms of services, two grocery stores, a myriad of shops, a drugstore, an SAQ Selection liquor store and two shopping malls - Cavendish Mall and Carrefour Angrignon - are all located nearby. 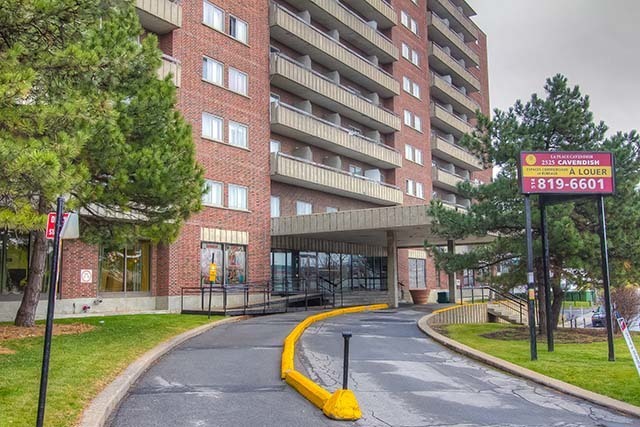 Finally, the building is a quick 15 minute walk or 9 minute bus ride from the Loyola campus of Concordia University, the new McGill University Health Centre (MUHC) is also nearby and a convenience store is open on the premises.